Selkie’s never had caviar, roe, ikura, etc; but I would imagine these are also things she would love. I don’t really pay much attention to the day each strip will air, so the Fishy Love panel is a serendipitous coincidence. Happy Valentine’s Day! I have a few extra things to add in today. Firstly, I’ve created an Ancillary Art page to catalog the wallpapers and miscellaneous other drawings I post from time to time. If you’re a newer reader and did not catch the wallpapers I posted way back when, now you can! It is on the top menu bar. Secondly, I did some Valentine’s Day sketches to share today. Felt good to draw the other kids from the orphanage again. Enjoy! If you don’t recognize the kid stealing Cupid’s bow and arrow, that’s Mark. He only appeared in two panels before getting adopted. Honestly, I HAVE had fish eyes before. I’m curious, how do they taste? Sorta like jelly, only a bit tangy as well. Not so much a pop as it was a “squish”. I don’t know if it’s just cache issues, but I only see “Home-About-Cast-Fan Art-TV Tropes” on the top menu bar. No “Ancillary Art”. Also, I love the diving Selkie in panel two. Should be fixed now, sorry! I’m really impressed with how the art in this comic has come along since starting. It really shows in the Valentine’s Day sketches as well. Hey there! I’m “new” (read some pages, lost the link, the found it again), and i wanted to use my first comment to say that what you have here is a really great, really interesting comic. I noticed on the TvTropes page that the Sue and Kathryn show is another comic that you do/used to do… where can I find it? I’m really interest in reading some other stuff you’ve done. Sadly, my first foray’s into webcomicery did not survive the deactivation of my old website. But I do have a scan of a Sue and Kathryn strip I drew about a year and a half ago when I was toying with re-starting it. The originals from 4-5 years ago were pretty bad, but this one I kind alike. If you ever decide to start it back up again, you’ve got at least one reader. Yeah, my Chinese girlfriend’s parents always eat the eyes. Hey that kitty is just like our kitties! I’ve nommed some eyes before, and they aren’t bad. Ate raw ones once, and it’s about how Selkie describes it, the taste itself is pretty good… the squish of them popping turned my stomach pretty bad, but I got it down. Lovin’ the carnivore + vegetarian thing. I have a milk allergy and I generally cook separate meals for my gf and I if I want to treat her (say: Spaghetti w/ Parmesan cheese or Shells and cheese, offhand), but she’s alright with mostly milk-free or milk-alternative (Almond milk is pretty tasty), because I do most of the cooking, and she’s super careful when she cooks. I’m looking forward to how they’ll deal with it, since I’m assuming that Selkie can’t actually digest/gain nutrition from anything but meat, while Todd’s aversion is either opinion or morality (I don’t think he’s said why he’s a vegetarian, but I may have missed it…). Also: Sorry for the novel, just personal, related anecdotes. Also, unless I’m mistaken, Caviar is Sturgeon roe and Ikura is Salmon roe, where roe is the eggs or reproductive organs of certain sea critters, so all three of those things are the same thing, kinda. Also, the term you’re thinking of would be the difference between “hard” and “Soft” roe, unless I’m mistaken. 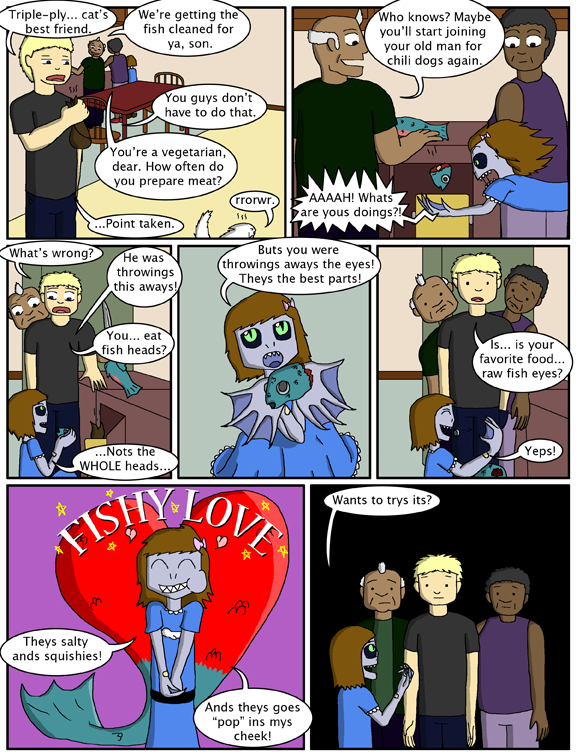 The last two panels are absolutely priceless: the second-to-last for “fishy love” (makeitintowallpapermakeitintowallpaper) and the last for the expressions on Todd, Theo, and Mari’s faces XD. Eugene: None of us bites off chicken heads–well, except Curly. Curly: Yeah, and that was just the ONE time! I miss that show :). Dave> She’d love sushi minus the veggies, so sashimi:) Um, I’ve never eaten fish eyes before but I’d imagine they are kinda gummy? I’d assume you are correct that it may be salty it was an ocean fish but then again maybe Selkie has very sensitive tasters and can detect even tiny hints of salt? I love the sketch of Selkie for Valentine’s day. It is one of my favorite ever pics of Selkie and I’d love to see it colored:) And yes, it was a serendipitous strip indeed! I remember convincing somebody tapioca was fish eyes once. Aw, c’mon, everyone knows it’s newt spawn. Yes, whoda thunk that the dead fish head could change it’s expresion! LOL. Also, that 4th panel really show’s off Selkie’s hands. Nice job on the hands Dave! I think Selkie would sing this a lot. …aaaand now, there are two more vegetarians. I honestly thought she WAS going for the head, since I know it’s a rather common thing to eat. I guess it’s the seafood equivalent of ribs. So yeah, I was surprised to see she only wanted the eyes. You’re art for Todd and other people hasn’t really improved all that much, but your art and designs for Selkie are improving vastly. As the final note, it’s the pitch black background of the last panel that really does it. I absolutely loved the last 3 panels of this one Dave! Loved those expressions on the parent and grandparents! ROFL! Poor Todd! So many startling revelations in just a few short hours! (Selkie can’t eat vegetables, a fortune in shoes, and now fish eyes!) Talk about culture shock! And I do have to say again that you did a great job on Selkie’s hands in the 4th panel. How can something be both so disturbing and so cute at the same time? The mind boggles. Discovered this today and read straight through. Wonderful comic. I am loving it. D’awwwwwww!!!! Selkie is so ADORABLE in panel 6! I didn’t know where to laugh or die from cuteness exposure…. so I did both! I’ve seen the survivor type people on tv (the real ones that teach you how to actually survive in different environments – rather than how to stab your buddy in the back and let the bears have him while you run away) eat the eye-balls of various and sundry critturs. It doesn’t make sense to me – if the crittur is fresh enough to eat the eye-balls – it’s got LOTS of other really fresh parts that seem to me to be better eating! Haha, it still seems weird in hindsight. I LOVE Duck Soup! One of the Marx Brothers’ best! Actually, they’re eaten in the Southern US! By whom? I’ve lived in the South my whole life and I’ve never eaten or been offered fish eyes. I think Selkie would fit right in if she went to Japan! I love how Selkie always knows a way to make people go ._.